Close on the heels of its list of “Best Ever” Test and One day International batsmen and bowlers, the International Cricket Council today released the list of the Best fielders of all time and like the previously released rankings, this one is all set to lead, once again, to a reevaluation of what constitutes cricketing excellence. Releasing the list, ICC representative said that a complicated, proprietary ranking function was used to create this list weighing in factors like “fitness”, “grace”, “enthusiasm” and most importantly “match impact” using the same algorithm that was used to rank batsmen and bowlers. Needless to say, the list is surprising. Phil Tufnell, famous for fielding displays like this [Video] is at the top of the list. Monty Panesar, dubbed the Second Tufnell, and Sourav Ganguly come in a close second and third. Jonty Rhodes languishes at number 58 and Ricky Ponting is 46. Arun Lal, recently awarded ICC’s commentator of the millennium and Filmfare Ram-banaye jodi along with Rameez Raja [video here], spoke exclusively to GBTV about his reactions on the latest rankings.Trying to summarize Arun Lal’s reactions, which he took the greater part of two hours to get across, this correspondent found that he did not say even one thing of any importance. He however adjusted his necktie six times, combed his hair eleven times, and looked at flying birds seven times. Sandip Patil, about whom it was said that “when he circled beneath a high catch, no-one could tell if he was trying to catch the ball or whether he was praying to God with his fingers pointed heavenwards” seemed a bit miffed to be number 7 on the list. Talking about Dwayne Leverock who came in at number 4, a position Patil thought he deserved, he remarked cattily that the weight of the person must have been in the numerator of the top secret formula. If not for physical weight, how else can Hayden come ahead of Sachin Tendulkar in the rankings of all-time great batsmen ! Deep Dasgupta was also disappointed that he was not in the top 10. When pointed out that wicketkeepers were deliberately kept out of the scope of the list, Deep said “To main kaunsa wicketkeeper hoon?” Blaming his exclusion on the fact that he plays for the ICL, Deep said that he was sure he would get a honorable place in the list for all the one-drop one-hand catches he had taken in the course of his career. Not so pleased however were the supporters of Javagal Srinath (number 12 on the list)—all two of them. Said one: ” After all these years of throwing underhand and circling his arms around to throw in for the deep, after all these years of giving three runs when there was two, Srinath has once again been deprived of his rightful place in the Top 10.” Said the other “I don’t want to talk about myself”. However the most opposition to the rankings was witnessed in Pakistan where fans were so angry that Inzamam ul Haque was not even on the list that a few of them got on a boat and started sailing towards Mumbai without making any hotel reservations . Said one commentator who did not want to be named (he once pointed a bat at Venkatesh Prasad, number 15 on the list) ” This once again shows India’s influence inside the ICC. We all knew that India were going to take a vendetta out on “Alu” ul Haque the day Pakistan imposed a 25% import duty on Indian potatoes in retaliation for India saying that Kasab is a Pakistani. Some cricket fans however are skeptical about the whole ranking endeavor of the ICC. “If there is anything that shows what a farce these rankings are—in the bowling list for Tests, Steyn comes before Donald and Lillee ! I don’t know if they pulled this list from chits in a hat or drew straws or used a mathematical algorithm, my only question is that did common sense enter anywhere into the ranking process?” asked an irate cricket fan. Maninder Singh, who has been for the last few weeks wearing a T-shirt that says “I am one rank above Wasim Akram in the list of great ODI bowlers” pooh-poohed away the skepticism saying that the rankings confirmed something he had been saying for many years now, that his bowling record [rank 14] was better than Wasim Akram [rank 15] and Kapil Dev [rank 17], a statement that he repeated so often that before the rankings came out, people mistakenly thought he was on illegal drugs. You mark my words, Arnab. As I told you earlier, this is a test prank the ICC is pulling on us before the finals on the 1st of April. Just you wait and this. This bleeding travesty *cannot* be true. 😀 Good list, GB. BTW, I won’t be surprised at all if ICC comes out with a similar (the same?) list for the “best ever” fielders. I, for one, would be interested in taking a look at the mathematical algorithm or farmoolah or whatever (/wherever) ICC pulled out these “best ever” lists from. It is quite amazing that the firangs still have a stranglehold on the core functions of the ICC. Noone wants pawar and his manoos take it over but it should at least bring some transparency. Arnab, let me ask u something..
Say, you have Tendulkar who in a high pressure situation, comes makes a 100 and gets out without finishing it off and ultimately the team loses.His 100 is laced with glorious boundaries and sixes, but when he was just supposed to carry on , he plays a rash shot and gets out. And you have a Bevan who comes in, dibbles and dobbles one and twos for a 75, but makes sure he side reaches safely ashore. Keep your patriotism aside and think, what is it that ultimately we want? To lose gloriously or win humbly? I would anyday say Bevan was a better one-day batsman than Tendulkar. An Bevan has been in as many high pressure situations than Tendulkar, and his success rate is also higher. Yet he is below Tendulkar. P.S. : It is satire. And y was the “the gateway of india” navjot singh siddhu kept out of the best fielders list? What about Ravi Shastri? 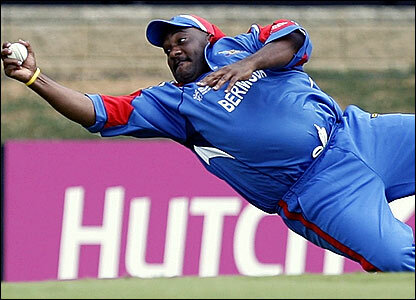 He deserves to be on # 1 – best fielder ever. I’ve never an Indian fielder as lazy or slow like Ravi Shastri. Seriously, this guy would step out of the ball’s way if it sped towards him. I’ve never seen an Indian fielder as lazy or slow like Ravi “Two Toed Sloth” Shastri. Ravi Shastri may have been slow on the field but man! was he fast with his women and cars. “in Pakistan where fans were so angry that Inzamam ul Haque was not even on the list that a few of them got on a boat and started sailing towards Mumbai without making any hotel reservations .” – Shouldn’t there be bhaichara bouquets this time around ??? I totally agree with you. Bevan remains one of the best finishers I have seen. But to compare with him Sachin Tendulkar and claiming that he is a better batsman than Sachin is unfair. You need to compare an opener to an opener and a middle order batsman to a middle order batsman. If you were comparing Bevan to lets say Yuvraj or Jadeja, then that is a good comparison. The media has unnecessarily gone mad over the ‘Best-ever’ ratings. It only denotes the peak rating of a player and nothing else. And that list has been there on ICC Rankings website for the last five years. Wonder how so many people can froth at the mouth for no rhyme or reason. Jobless idiots! So this list has been on the ICC rankings website for 5 years ! Like from what 2004? So let me get this straight. Dale Steyn, even before he made his debut (or just after) was already on this list ahead of Wasim Akram !!!!! I think the next is the greatest sports writers list ICC will bring out. Rajan Bala will kill the jury if he’s not declared the greatest and Vedam Jaishankar will kill RB just after that! Some other gems in the ODI list – Roger Twose(48),Boycott(71),Vinod Kambli(81)and Sanjay Manjrekar(96) all in top 100…Kris Shrikanth….get a ride man…u r only 1ooth. Topu da of my para(locality) had peaked during the matches against the neighboring ‘Jubak Sangha’, back in 1998. Had three 40 scores in three consecutive matches,(10 overs a side), & we won all the three matches. Its outrageous. I can’t find Topu-da’s name in the top 100. The “ICC Best-Ever Test Championship Rating” list of batsmen and bowlers have been there on the website since 2004. The list gets updated as and when some player achieves a peak rating that can influence a change in the rankings. For example, Hayden was at No.9 in this list when he reached a peak of 935 in Nov, 2002. He dropped one place (to No.10) when Sangakkara reached a peak rating of 938 in Dec, 2007. How can they even release it without mentioning “anil Jumbo Kumble” in top 10… He used to consistently dive after thoroughly checking there is no “khadda” around so that he can slide 3 mtrs flat without disturbance!! and also made sure he dived after the ball has passed the boundary line and reached the wicket keeper through, the able hands of those kids who are waiting outside the boundary lines…!!!!!!!! dhananjay, exactly. It is just a list of players sorted by their peak ratings as per the ICC rating mechanism. The rating mechanism itself is pretty good one. It takes into account factors like opposition strength (by considering the ratings of opposition players you played against), pitch conditions (looking at the number of runs scored in the match), match condition (when you came into bat etc), contribution to victory, home or away, etc. It is completely objective – i.e. all the above mentioned factors are derived from nothing but what is available in the scorecards. And these ratings get updated after every match. The mistake ICC did was in terming this list as “best ever” and also adding things like this list reflects those who have done consistently well, etc whereas it does nothing of that sort. It has nothing to do with how consistent a player was through his career. It just shows how high a peak he reached during his career. So while someone like Tendulkar maintained a consistent rating of around 890 through his career, someone like Hayden could have a 930 rating for a few months of his career while doing low 800s for most of the career, latter will get ranked higher in this particular list. Who you consider better depends on whether you are more interested in the peak performance or in the average performance. on a serious note, ICC should keep bringing up these lists to bring back smile on people’s lips in these troubled times. I think the catch that Duminy took in the last T20 & the one Kemp took in the second final of ICL last year was outstanding. It is unfair to claim Bevan is a better ODI batsman that Sachin, purely because the role of an opener is different from that of a No.5/6/7 batsman. Sachin has, on numerous occasions, set the tone for an Indian victory with his authoritative strokeplay, only to see his team-mates fritter it away. Bevan’s strength lay in assessing the match situation and play accordingly. He was a genius in that role. As far as I am concerned, Sachin and Bevan will simply walk into an All Time ODI XI, the former as an opener and the latter at No.5. How can they even release it without mentioning “anil Jumbo Kumble” in top 10… He used to consistently dive after thoroughly checking there is no “khadda” around so that he can slide 3 mtrs flat without disturbance!! and also made sure the ball has passed the boundary line and reached the wicket keeper through those kids who are waiting outside the boundary lines…!!!!!!!! Did you read the explanation that they gave out after the tendulkar controversy? You do know that this rankings have nothing to do with how players performed over the duration of their careers? Although the last comment on Maninder Singh was hilarious as usual but let me say he was furious when he heard about the rankings and so was the case with most of the cricketers … Most of them regarded them as farcial and deemed it worthless…. Not even worthy of mention…. According to you, what are the the factors that must have come to play while making the ICC ‘Best Ever’ list. Like Mohan has mentioned ‘ factors like opposition strength (by considering the ratings of opposition players you played against), pitch conditions (looking at the number of runs scored in the match), match condition (when you came into bat etc), contribution to victory, home or away, etc. ‘ And how is it put in a formula or whatever? And how is it calculated ? How do they figure out where to put what? Who could have made such a formula? (Does that mean that Guru/s of Duckworth& Lewis are also working for ICC. If so, does he/dont thet deserve some award-shaward?) Please enligthen. Ehh the list missed harbhajan’s excellent feelding tactics which kept Andrew caught out for long time. @Martin: Dhananjay has put it very appropriately and that is why i asked you if you’d chose gilchrist or bevan. thats because you cant chose between them. their jobs and roles are different. Bevan might not have succeeded in opening position. He didn’t even play a great deal of test cricket for australia. but that doesnt make him any lesser ODI batsman. he will surely be one of the best. Anyone else notice that Rameez Raja’s hair is just like Rod Blagojevich? Munaf Patel is also like Sandeep Patil. Now I understand why he keeps circling and looking up. Like Deep Dasgupta, Parthiv Patel bhi kaun sa wicketkeeper hain? I couldn’t agree with you more! Afterall what good an “opener” is when he churns out hundreds, scoring half of the team’s runs, loaded with shots that have made Bradman confide in his wife how good a replica Sachin is of him, when he isn’t there on the pitch scoring the winning runs. Infact, what in the name of hell are this Richards and Laras doing at the top. Had Bevan been an opener, we would have seen Gilly and Haydos fighting over the bat and saying “Yaar… last match also you batted first na. My turn today!” along with Bradman’s wife longing for the chinaman’s smell in her bedsheet. Bring on the Bevans! Throw in a tablespoon of Robin Singh, and some Orams for flavour, and you got your list. Finishers or Best batsmen ever, whats the difference. Said one: ” After all these years of throwing underhand and circling his arms around to throw in for the deep, after all these years of giving three runs when there was two…” Said the other “I don’t want to talk about myself”. Now we have a lot of middle order batsmen.Name one who has consistently,under pressure,delivered the goods. Please Mr. Fatman, I am not talking of position here, but of the ability to win matches. Tell me,hasnt Bevan come very early in the innings during a top order collapse and held his own? How different is it from opening the batting? And tell me does the opener operate under more pressure or someone who goes out there when hs team is in tatters? Tendulkar has had many opportunities when he has been at the other end when wickets are falling.With the exception of, say Sharjah , how many innings come to mind where he has fought it out? On the contrary , I feel Rahul Dravid or Dhoni is more reliable. I am not discrediting any of his achievements but when choosing someone who is the finest, a number of thinhgs like these have to be considered. Opening the batting & coming in at no.4 ,5 or 6 are light years apart. Comparing Tendulkar’s reliability with Dhoni is just not on !!! When someone is walking in chasing something around 260 to win a game & the other batsmen in the team are the likes of S Ramesh,Nayan Mongia,A Jadeja, a fading Azhar & a Robin Singh , its is definitely a different experience than coming in at no.5 after Slater,Martyn, Steve & Mark Waugh. ..& for that matter how many times did the Aussie line up collapse in Bevan’s days? Most of the time the top order had done a jolly good job…& it was left to Bevan to take them home(something he managed with amazing regularity & should be respected for that ). Bevan would come in around a 15 overs remaining, Aussies requiring 90-100 to win & 5 wickets in hand. He did a great job…no doubt. But Sachin had to carry the entire Batting on his shoulders. Your team is chasing a big score and has lost half the side….if you were batting whom would you prefer to have on the other side….Bevan or Tendulkar ? And that the Aussie line up was strong is not Bevan’s fault…He came after most of the big guns had left…that the Indian lineup had pansies is a wonderful example of our “diversity in unity” regionalistic nature of selection…. If your team is chasing a big score, whom would you prefer to open with…Bevan or Tendulkar? I know the above question is absurd, just like yours. I would love to know the names of a couple of ODI openers in the history of cricket, who have been there right till the end (atleast 5 times) while chasing a score of 250 . Dude if you really think Bevan v/s Sachin is an apples to apples comparison, there is something seriously wrong with the way you analyze things. In fact, I would never expect my opener to finish the game. For that you need good middle/lower middle order batsmen. The job of an opener is to lay the foundation for a victory, and in my opinion Sachin has done that on a regular basis. And even if you believe Bevan is somehow a better one day player that Tendulkar is, would you like a batting order composed of 6 Bevans or the best specialist player for each position? LOLLLLLLL.. I can not stop laughing!! If Inzi is not in such a list, I would object too. Even though he took all catches that came his way (and even some that weren’t headed towards him, just because of the surface area advantage), his *grace* in the field – hand on hip, using choice words for his bowlers – alone should qualify him as a “model fielder”. Thoroughly correct. See, when people criticize this ranking system or say, the Duckworth/Lewis method, I don’t get it. I think they are great with a lot of objectivity thrown in. I think its ultimately ICC’s job is how they use them, and boy, do they do a really shoddy job in that! Calling these rankings best ever or solely relying on D/L for rain affected matches is where it gets downhill for them. Actually I have been viewing these ranking for last 4-5 years and they give a lot of insight into how batsmen/bowlers are peak-ing. It was very stupid of ICC to publicize them as “Best ever” rankings as they are not and they weren’t ever designed to be one in the first place. small eg of how illogical things are with cricket in general! Why isn’t anyone outraged that Tendulkar isn’t on this ‘all-time’ list?